Das zweite Album "Stories", das seit cirka einem Jahr angekündigt ist, wird nun doch endlich releast (2. Oktober) und ab heute kann man es bei iTunes & Co. vorbestellen. Dafür erhält man unter anderem diese neue Single, die mir jetzt noch nicht so sehr gefällt wie es andere Songs taten. Knappe 4*<br><br>edit: Zu meinem Erstaunen gefällt mir das mittlerweile echt gut. Eine knappe 5* liegt nun drin. Gefällt mir etwas besser als das ebenfalls als Vorgeschmack aufs neue Album veröffentlichte "Pure Grinding", stellt aber auch wahrlich kein Highlight in Aviciis bisherigem Schaffen dar. Ein bisschen lasch ist es, auch wenns wenigstens ganz gut ins Ohr geht.<br><br>Knappe 4. I remember the day this was released, I was feeling rather miserable. 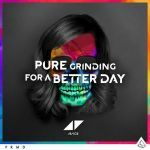 When I saw the "Pure Grinding For A Better Day" double single release consisting of this and fellow "Pure Grinding", I was highly amused. <br><br>"Pure Grinding" captured my attention the most initially, while this was less instant but more enduring. I came to dub this the "You Make Me" of "Stories" at the time. The one that surprised me by being not what I expected, becoming my favourite from the album and then going on to have an underwhelming chart run while being forgotten quickly in favour of the previous single and the next one.<br><br>I love the drop the most, definitely one of my favourites of his career. Everything about this track is interesting though, especially the chorus which really grows. Quite sad lyrically (and especially so today) when you really look into it but I can totally relate. At the time, it really was time for a better day, and a better day was had. 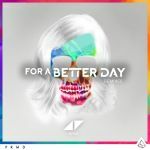 My only noticeable flaw is that it's a bit too short for my liking.<br><br>Thanks Avicii.